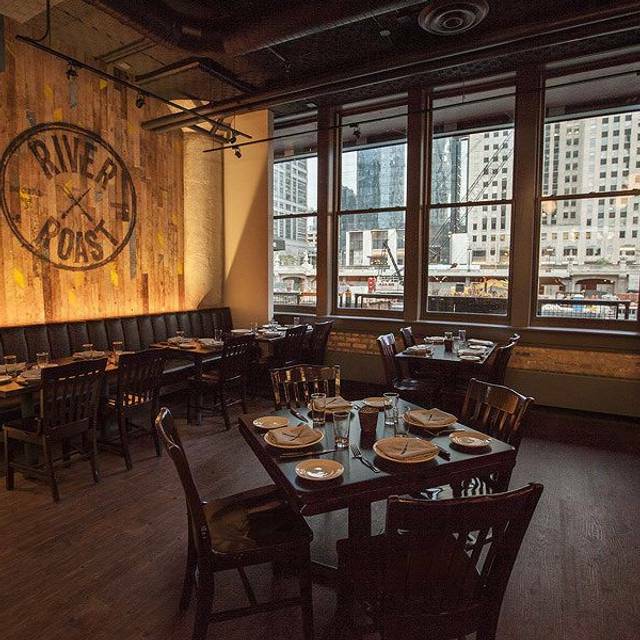 Situated on the iconic Chicago River with stunning views of downtown, River Roast is a lively social house and gathering place from James Beard award-winning Chef Tony Mantuano and Executive Chef John Hogan. 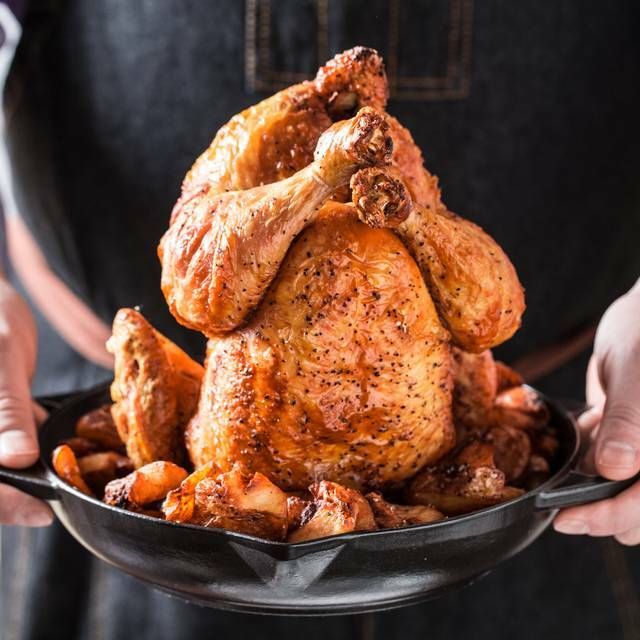 The menu features contemporary American tavern fare with dramatic presentations of whole roasted chicken, whole roasted fish and slow roasted beef; all carved tableside. The food is handcrafted, yet rustic, with many plates designed for sharing. The bar offers a large selection of local beer, craft cocktails, beertails, and wine. 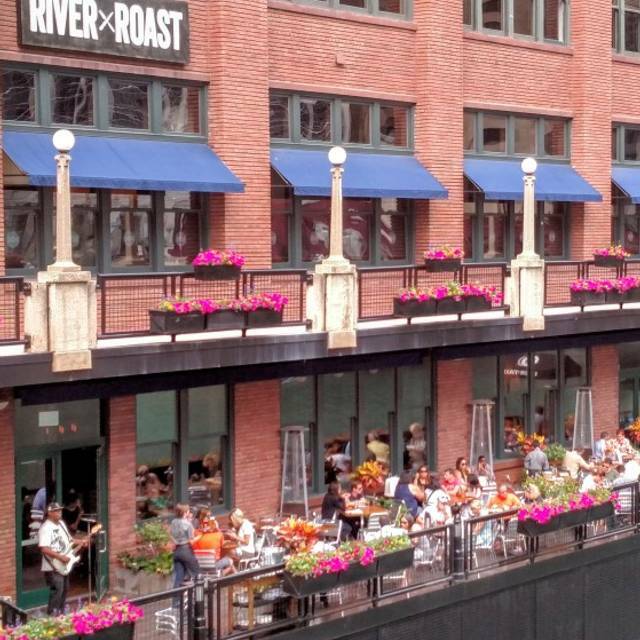 With one of the best patios in Chicago, River Roast is a great place to enjoy dining outside on a hot summer afternoon or a crisp fall evening. River Roast Private Events offers six spaces, all with spectacular views, for parties from 10 to 1,000. 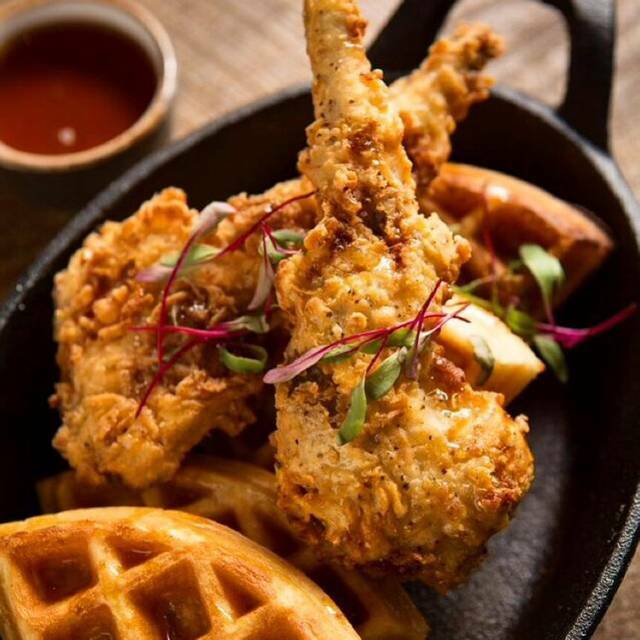 Saturday and Sunday features our Blues and Brews Brunch with live Chicago Blues Musicians performing from 12PM-3PM. We are open daily for lunch and dinner. With stunning views of the river and downtown, River Roast Private Events offers an impressive setting for your next party or meeting. 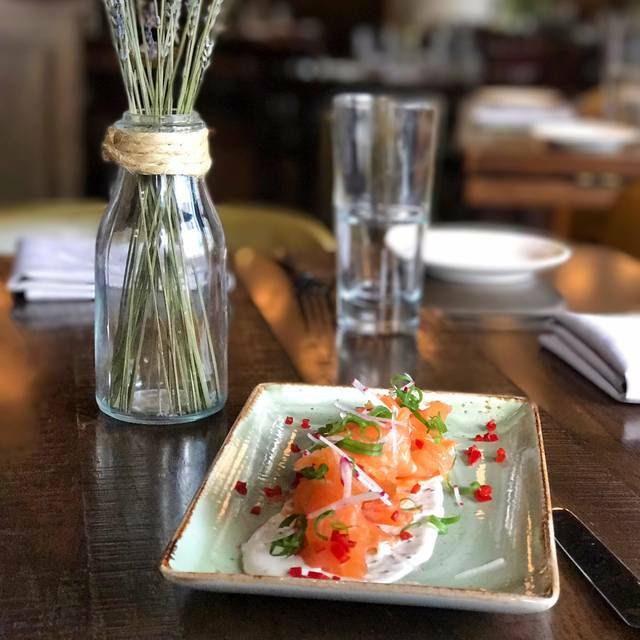 Helmed by James Beard award-winning Chef Tony Mantuano and Executive Chef John Hogan, River Roast is a lively social house and gathering place. River Roast’s curated brunch menu by Chef John Hogan paired with his favorite live Chicago blues bands. Whether you are planning a grand affair for 1200 guests or an intimate dinner for eight, our experienced event team will work with you to create a memorable event. With six spaces to choose from, each paying tribute to our historical landmark building, the options for corporate and social events are endless. 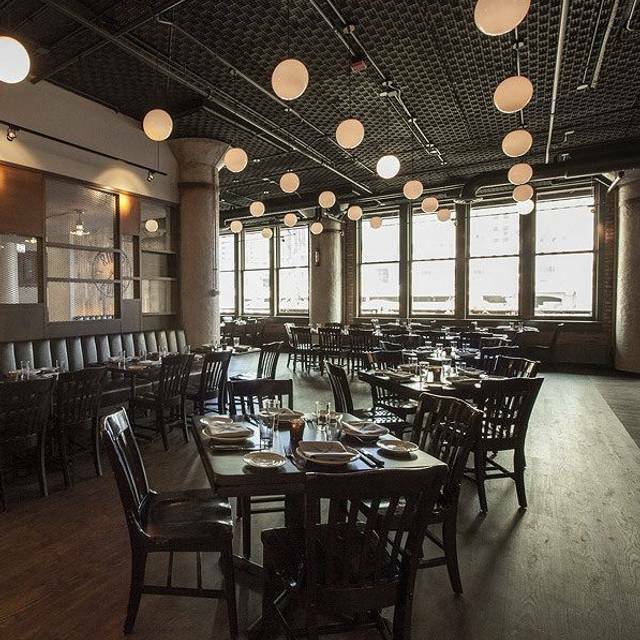 Contact our Private Events Team by email or by phone, 312-527-1417. We had a nice dinner as a treat for the Chicago marathon. The menu had options for my wife that's Vegan and has a gluten allergy. Seating was not geared to couples but we had a nice night in a busy and loud place. Delicious food and friendly, upbeat service. This place is best for groups, given the portion sizes. Good comfort food, as most of it is roasted and grilled. We were from out of town and came to River Roast specifically for the Blues Brunch. We thoroughly enjoyed the food and the music and we would wholeheartedly recommend it. Food and service was exceptional. The venison roast was amazing. Everything we had was prepared perfectly, so it was a great evening! great food (the chicken is always amazing!!) and great service. Definitely recommend going with a group, as all dishes are family style. If not, you will have great leftovers! Lives up to expectations. Not a fine dining experience but fine dining in an informal way. One of the best places in town! Had a great time at River Roast going out with family for my birthday. We were sat immediately and the service and food were great. Thank you. Can slways count on a great meal at reasonable prices. I had my family in town, and wanted them to have an on-the-river dining experience. I had heard from my friend that River Roast was excellent. She also told me they serve huge, shareable meats. Boy, did they! It was a little too chilly to sit outside. So, we got a table by the windows. The view was still outstanding. We ordered both a fried rabbit's leg and a ploughman's board apps. Wow, they were great! We then got the roasted chicken with potatoes as the main with a side of their blackeyed peas. Holy Cat's Eye! It was some of the best chicken we'd ever had. No dessert was had for fear of popping. I will definitely be back. This is a great place with a great staff. I highly recommend it. The food was tasty but VERY overpriced. It is meant for sharing, so hard to go if everyone wants something different, for example, 3 of us went and 2 were meat eaters, one was not. Had to get 2 entrees, as since portions are shareable for large groups, needed to order much more than would have otherwise. Only one fish choice on the menu and happened to be one I do not care for (sea bass). Best thing on the menu were the appetizers. Had the burrata and the sauteed mushrooms. Both excellent! Brian is the best server, ever! Great recos! We loved everything we ordered! Loved the place, lively with a very nice view of the river. Food was savory and potions generous. Seriously best food I have ever had in my life. The chef is amazing! Stop reading, just choose this place. The food was excellent! We had the tomahawk pork and it was so tender and delicious. However, I wish there were more gluten-free options for bites (appetizers) and sides. Otherwise, I love this place and really enjoyed it. Would recommend to anybody! Loved the fried rabbit. The meat was verry tender inside and the outside was nice and crunchy. We also ordered the beet salad which was a blend of arugula, tomatoes, goat cheese and other tasty vegetables and seeds. Our dinner item was the stake. The portion was large and for the two of us was plenty of food. We ended taking half of it with us. The food and service were outstanding. My friends were raving about everything being just fantastic. Seated immediately. The views of the river were beautiful even on a rainy evening. Just go. You will love it. They called last call before we got our main dishes. Our reservation was at 8 pm so it was not super late but the place was halfway shut down. I brought six out of town guests and was extremely disappointed with the experience. Not your usual pancakes and eggs brunch. Interesting food with New Orleans twist. Very accommodating with requests for how you would prefer something cooked. Nice live music and lots of TVs for viewing Sunday football. Beautiful location. Food was just ok.
First let me say we dine out often. My wife and I are foodies and frequent many of Chicago's top restaurants. 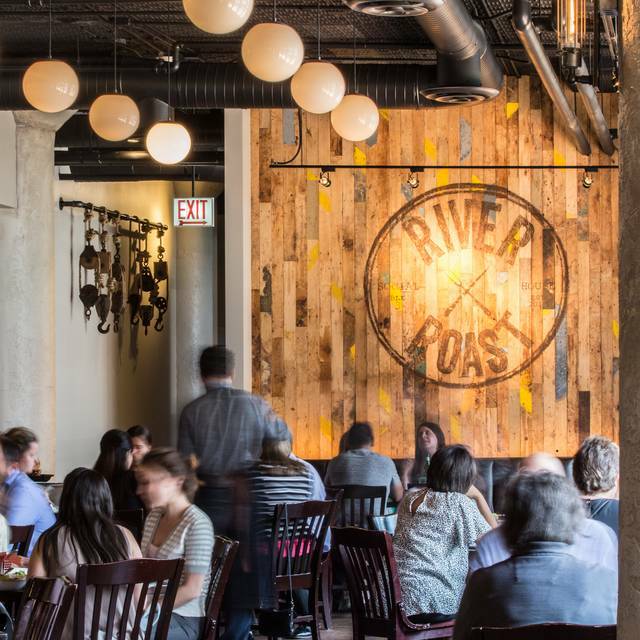 River Roast was without a doubt our worst dining experience of 2018. What was described as the best roasted chicken in Chicago was dry and half of it came home for our dogs to finish. The prime rib was about 30% fat and the horseradish sauce was mostly sour cream with barely a hint of horseradish. I've had much better for less at Wildfire. As for desserts, I love key lime pie but have never seen it served with "torched meringue". It was kind of like marshmallow cream that had been torched and it detracted from a fairly decent pie. We ordered coffee with our dessert but it didn't arrive before we were done. It took at least another 20 minutes to get our server's attention to get our check and the restaurant wasn't even crowded at that time. I wound up apologizing to our guests for our choice of restaurants and just want to warn others so they don't make the same mistake. We loved the blues brunch-lively music and delicious food with terrific drinks on a Sunday early afternoon. The Bloody Mary with a daily skewer and a beer back was definitely a hit with our group. Service was exceptional, Jana was really pleasant and went over the top with service and hospitality. Took colleagues from Tokyo for Sunday brunch. The weather was perfect and we sat outside by the river. The view was outstanding and the food was great. Very attentive service. My friends enjoyed the outing very much. Our first time to River roast, we sat outside along the river, it was a gorgeous night, wonderful food and great service. Our favorite dish by far was the roasted corn side dish- amazing! Didn't love the peach cobbler, biscuits were very dry, and overall I thought all the portions could have been larger, not quite enough to share between 4 people. But very good, we will be back! Disappointed. Second time there. Better to stick with Bar items and apps. Meat was disappointing. Service fair for a Saturday night. They were not that busy either. Perhaps it was just a bad night. I am gluten and dairy free due to medical conditions and I was very appreciative of the whole staff accommodating my needs. It was an amazing night on the river, service was prompt and friendly. Food was delicious and enough to take home for lunch the next day! We will definitely be returning. We enjoyed the Food, service and having dinner along the river. This is amazing, This is a Must if you are Visiting Chicago. Take a Couple all meals are Family Style and plenty of food!!!! Make A reservation!!! Jay is an excellent restaurant manager: cordial and friendly. Jana was a helpful and engaging server. We will be back! Food is terrific but our waitress was a bit snarky. I have had great experiences here in the past though and will go again! Good food, really liked the chicken and whole fish. Nice scenic view although there was no available outdoor seating. Good, friendly, knowledgable staff. Music was a bit too loud.